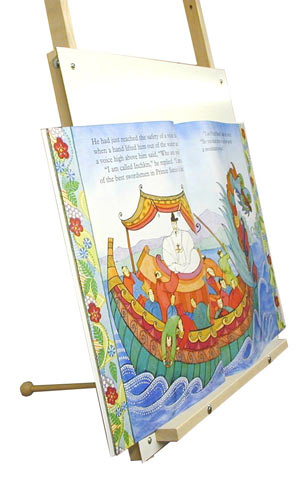 * Our Hanging Big Book easel was created with teacher input. * It provides real classsroom convenience, hanging on wall-mounted boards, doors, shelves, etc. * It can also hang on any wall, just attach the included mounting lip to the wall at any height that you choose!. * Use it as a display stand for books, posters and more. * Made from Natural Hard Maple, this easel features a large 24" x 24" dry erase art surface. * The hanging easel is also adjustable!. * The arms on the easel can be adjusted to 3 different heights: 46-1/2" ; 40-1/2" ; 34-1/2". Wood pegs in the lip holds things securely in place during use.